In a networked world, trust is the most important currency." A 1976 U.S News & World Report survey named Walter Cronkite the most trusted man in America - a moniker that seems unthinkable, almost laughable, for any public figure to have today. When was the last time we turned on the news or picked up a paper to find a story that wasn't laced with a point-of-view, a personal or political ax to grind or an opinion to promote? Today, it's not so much a question of if there is bias, it's howflamboyant and egregious it is. What of the stories that "journalists" now report? Corrupt politicians, corrupt businesses, corrupt government beneficiaries, corrupt policies and practices rigged to line corrupt pockets. Throw media spin on top of news about swindlers and cheats, and how can we even begin to peel away the layers of skew and dishonesty to get at any sort of truth? It is no surprise that with such pervasive deceit, there is a also a pervasive trust deficit in our institutions. In 2006, Edelman (an international PR firm) launched their annual Global Trust Barometer. This year, the results were, for the most part, not surprising: Our trust in institutions is on the wane across the world. Here in the U.S., we are a nation of skeptics. Edelman gauged the level of trust people have in their government, businesses, the media and NGOs. Trust is on the decline in all - except for media. A closer look at media's trust gains shows something truly fascinating. 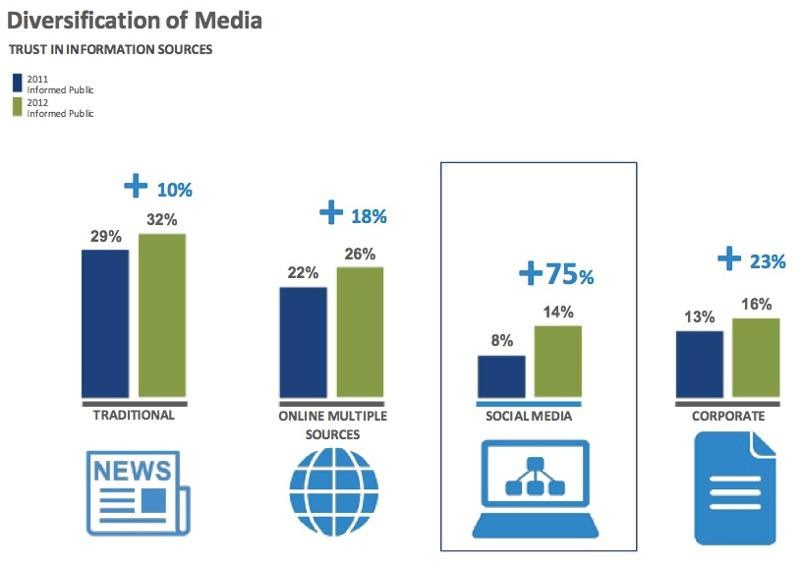 What's intriguing is the 75% spike in trust in social media, which includes social networking sites, content-sharing sites, blogs, and micro-blogs - our newest forms of media that are primarily peer-to-peer. In other words: We are losing trust in our institutions, but we seem to be gaining trust in each other. More and more, we are looking to each other for clarity and information. This burgeoning peer-to-peer trust is serving as the cornerstone to a new type of business model based on sharing, and a trend called "collaborative consumption," a term promoted by Rachel Botsman, a new-style venture investor. Would you rent out a spare room in your house to a perfect stranger? Well, millions do by way of Airbnb, a site where renters post available rooms and properties. Strangers are staying in another stranger's home. 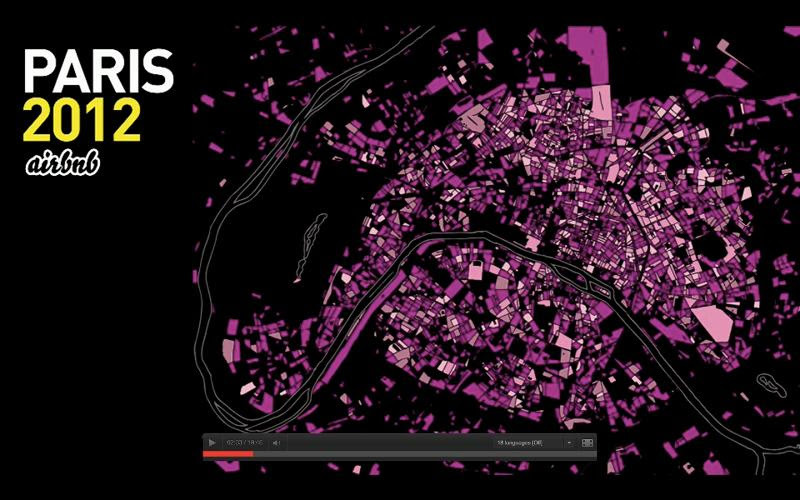 On the left is a heat map of Airbnb rentals in Paris in 2008. On the right, Airbnb rentals in 2012. Similar shared consumption is happening with all sorts of personal assets. 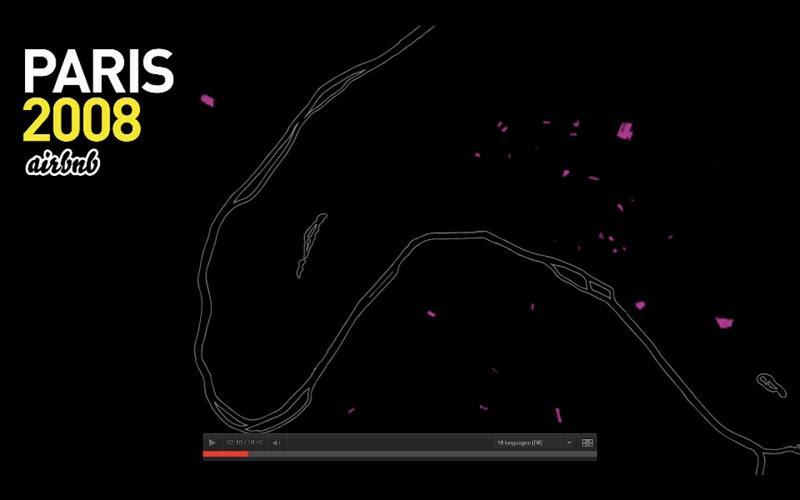 RelayRides is a company that allows you to rent out your car. TaskRabbit matches people who need a task to be completed with a person who has the skills to do it. In each platform, renters and rentees are both rated and reviewed, creating a contextual reputation. Naturally, those with higher ratings are able to generate more business and create a mini virtuous economic cycle around themselves - the asset in their personal micro-economies. It's almost like individuals are beginning to operate like mini businesses, replete with reputations, track records and transparency - except more of it. Will some traditional businesses that offer goods and services be replaced by those that merely broker the goods and services amongst individuals? What are the implications of building individual digital reputations? How might we be able to leverage these in the future? Which business streams might get totally disrupted? As we grow mistrustful of institutions, might the intersection of trust and an individual online reputation provide a hyper-transparency that upends the future of business, rendering our need to trust certain institutions far less relevant? Might this render the institutions themselves far less relevant? Might we become the most trusted people in America? Read on below in this month's section on the significance of trust in our economy and what it means as we leverage our trust with each other into businesses and revenue. The larger and more complex a system gets, the more systemic risk builds. There probably isn't a more important lesson from our economic circumstances over the last few years than how risk grows in tandem with institutional and infrastructure growth. The more components and dependencies in any system, the more there is that can go wrong. The 2008 crash drove this point home like a sledgehammer. Our systems and infrastructure had grown so complex that more and more inputs were producing lower and lower returns, until the entire system almost came to a dead stop. Institutions - governments, central banks, private enterprises and, arguably, the media - have worked together to keep the world functioning in its dysfunction as it had been. But individuals are beginning to understand our underlying fragility. Institutions may no longer be trusted to operate efficiently and per their primary economic or social purpose. Instead, they are ever more perceived as serving themselves, their own sustainability. It is no surprise, then, that individuals are abandoning traditional institutions and instead choosing to rely on other individuals. Don't be surprised to see fewer people locking their doors, and more people doing business on a handshake. If one can't trust the institutional system, then one must transition to the local ones where there is some semblance of control. Will cheaper energy and raw material costs bring manufacturing and production jobs back home? Likely so. But as automation continues to supplant human labor, job growth may not be sufficient to restore our pre-crash definition of full employment. Given the number of people who have dropped from unemployment stats, we could very well see job growth expand while unemployment actually ticks up. Our financial services market seems to be holding steady, with regional banks and natural resource-based financial institutions growing. The amount of money in private equity seems greater than its potential market opportunities, so future returns might be challenged. The more money flooding into hedge funds, the more they will post index fund type returns. Whenever there is an over supply of anything, prices must come down. In the case of financial services, this means compensation will likely continue to trend lower. We've recently introduced The TLV Entrepreneur Interview section. These days, entrepreneurship may hold more promise than most career paths. Necessity is the mother of invention, while prosperity numbs the mind of self-discipline. It's an ironic fact of life that it takes self-discipline to achieve most anything, yet great achievements can cause one to lose self-discipline. Might we actually benefit from a persistent low level insecurity, to serve as a reminder of our vulnerability and keep arrogance in check? Perhaps the best safeguard against falling prey to circumstances that threaten our self-discipline is to set intellectual - not financial, status or power - goals. Besides, when seeking the path of intellectual challenge and reward, odds seem high that economic reward will follow with reasonable sustainability. Never arrive, always be traveling. There were 3.6 million job openings on the last business day of December, little changed from November. The hires rate, 3.1%, and separations rate, 3%, also were little changed in December. Job openings increased over the year for retail trade, real estate and rental and leasing, educational services, and health care and social assistance, but decreased in mining and logging and in professional and business services. The Midwest region experienced an increase in job openings over the 12 months ending in December. Over the 12 months ending in December 2012, hires totaled 51.8 million and separations totaled 50 million, yielding a net employment gain of 1.8 million. One of the earliest and most obvious indicators that pockets of people were looking to a back-to-the-basics economy was the farm-to-table trend. In farm-to-table delivery, the path from farm to consumer is shortened and simplified, and often by way of farmers markets, where farmers sell crops directly to consumers. 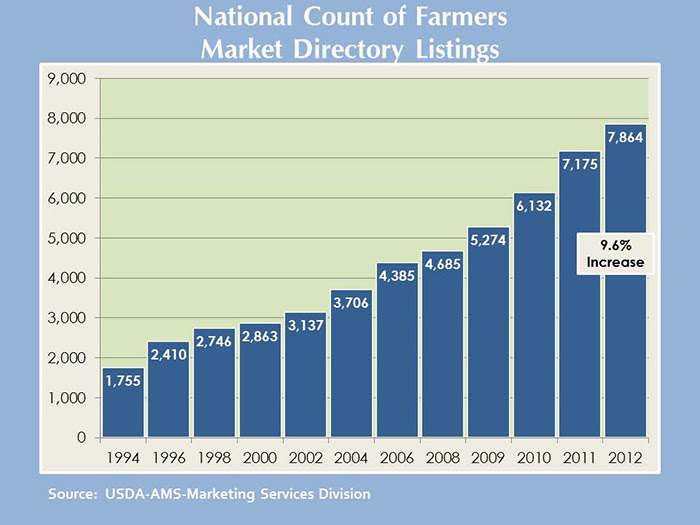 Since the Agriculture Marketing Service (an arm of the USDA) began tracking known farmers markets in 1994, the markets have increased by 343%. Houston is not only an ideal environment for entrepreneurship, it is also a town of enterprising and innovative minds. In this TLV Entrepreneur Interview, we celebrate Houston's entrepreneurial spirit and gain insights from those who drive it. TLV: How did the Armenta Collection get started? Emily: I come from a family of artists, so I was introduced to beautiful works of art at a very young age. Surrounded by artists, I have always had a lot of support to express myself through my artwork. As a result, I have been designing, sketching, and working with stones ever since I was a young girl. It has always been a passion of mine. Designing jewelry has not only been a vehicle for me to express my creativity but also my thoughts and emotions. However, I did not realize that my passion could become a reality and a career path until I began the MBA program at Rice. While taking an entrepreneurship class, I was given an assignment to create a fictitious company and write a business plan. I chose to focus my project on my passion, which is designing jewelry. I was very fortunate to have the support of the school and an amazing mentor who not only believed in me but also gave me a chance to fulfill my dream. TLV: What is one of the greatest rewards of owning your own company? Emily: My biggest reward is being able to give opportunities to those around me, watching them thrive and grow, and together accomplishing things we never thought were possible. TLV: What is one of the greatest challenges?? Emily: As the company grows, the biggest challenge is the rising demand for my time while wearing multiple hats as designer, CEO, wife, and mother. I have put my heart and soul into this company and I look around at so many people who are doing the same [for my company]. I know that they are depending on me to lead us in the right direction. TLV: How do you overcome challenges to keep your customers and employees happy as well as keeping the company running successfully? Emily: I believe by empowering those around me and building a strong culture, my employees stay happy. In turn, their happiness, and the passion for what we are doing, comes through to the customers. TLV: How do you find Houston as a home for your start-up? Emily: I have been fortunate that the people I have met in Houston lent me a hand and helped me up the ladder. From my professors at Rice, to our group of investors, people are always available to help and support me and the business. I also think that Houston is a rich, vibrant, multi-cultural city with ample talent to fuel an organization that is growing in the U.S. and abroad. TLV: What would you like people to take away from Armenta? Emily: After I started the company, I realized this was a great opportunity not only to make beautiful jewelry, but also to tell an amazing story about inspiration and dreams. The story behind the women who work at the studio is truly one of inspiration and is what the American Dream is all about. I feel that I have been given a chance to make a difference in the lives of others and challenge the status quo. This belief is a guiding principle that we at Armenta all embrace and strive to pass on to others. TLV: What differentiates Armenta from your competitors? Emily: Armenta is a luxury brand that isn't afraid to be bold and daring in its design point-of-view. Through its unusual combinations of metals, gemstones and diamonds, Armenta has created intricate, artisan jewelry that has a perceived high value and evokes a passionate response from consumers looking to differentiate their wardrobes. Armenta is a pioneer in developing new types of products, whether it is with our handcrafted jewelry or one of the brand extensions to come. Emily: To follow your dreams and give back to those around you. TLV: Where do you hope to be with Armenta in 5 to 10 years? Emily: My goal is that I continue to grow the company into a global lifestyle brand while setting an example for others through telling our story. At Armenta, it is not just about beautiful jewelry and, soon, handbags, but it is also about creating opportunities, whether through the artisan school we have started or hiring people for their passion and heart who are looking to be given a chance. Emily: To reach for the stars with me and believe that anything is possible. To learn more about The Armenta Collection, please visit www.armentacollection.com. 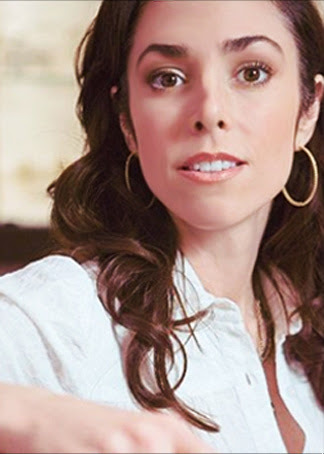 Rachel Botsman, a key player in the collaborative consumption movement, takes the long view and argues that the shared economy will segue to a world where our reputations will be as significant and portable as our credit scores. She envisions a day where, when applying for jobs, hiring agents will look up our reputation score, stored in a cloud database. In this event, will the internet become a sort of Orwellian big brother? Or will the hyper-transparency be a gentle pressure to always behave our best? 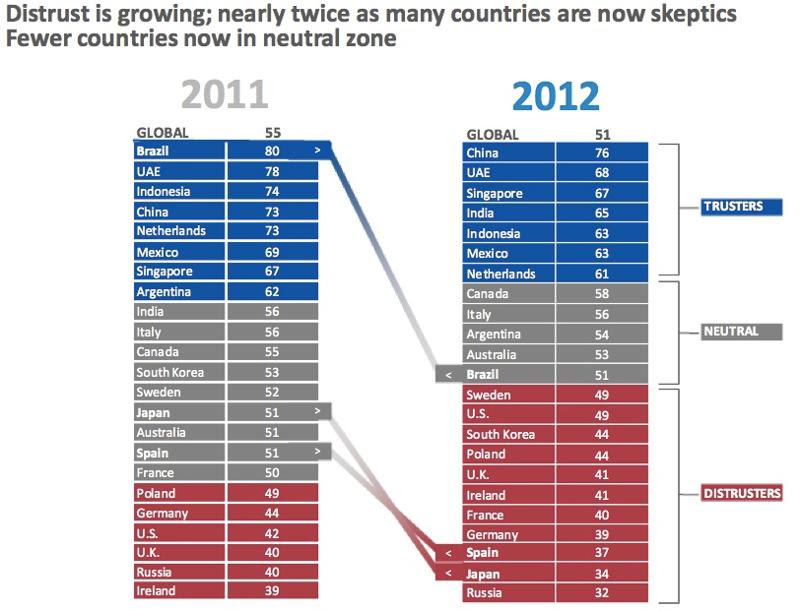 Governments saw a global 9-point drop in trust. Businesses remain more trusted than governments, but 49% believe that businesses are not regulated enough. Financial services and banks remain the least trusted of the industries questioned; technology remains the most trusted. Government officials are ranked the least credible spokespeople. Academic experts are ranked as most credible, then technical experts, followed by "a person like yourself," ranking third. 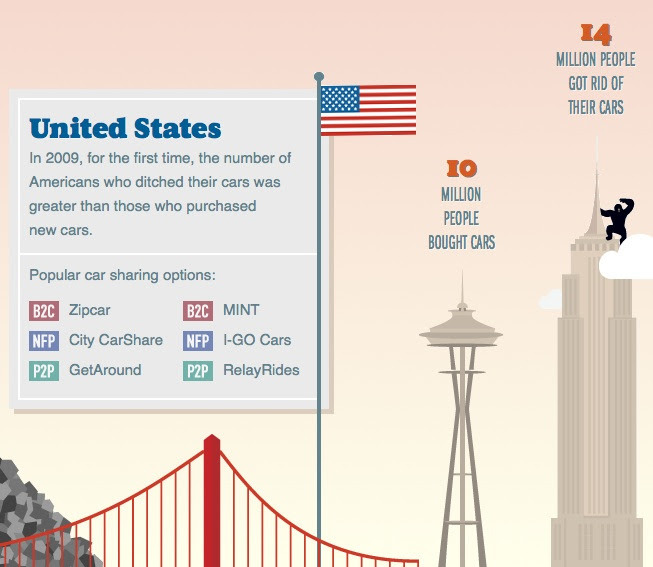 This excerpt from a full infographic reveals how car sharing is transforming how we think about car ownership. Specifically, it's challenging the notion that we need to own a car. Car ownership is dropping, in part due to the ease and low cost with which car sharing enables access to an automobile, taking emissions down with it. Follow the link for the full interactive infographic. It begs the question - what sort of impact could a sharing economy have on preserving and optimizing resources? How might it transform our perception of what constitutes a need? This article's author tosses around some lingo that represents components of the trust economy - the micropreneur and spare capacity. Spare capacity is self-explanatory - excess capacity that is going unused. The micropreneur is the enterprising person who sees their personal spare capacity - be it skills or a bike - as something that can be monetized, while they themselves are the businesspeople who will monetize it. Not only will this preserve resources and diminish waste, it is also allowing a generation facing limited job opportunities to find more efficient uses of time, money and assets. When 32% of online consumers say they're more inclined to trust a perfect stranger over a brand, there's a trust problem. This is not auspicious news for brand marketers. Follow the link for an infographic about how to create the most compelling content marketing that inspires trust and elicits action from consumers. and it is prudent never to trust wholly those who have deceived us even once." Economist: How long does it take to earn $1 million? 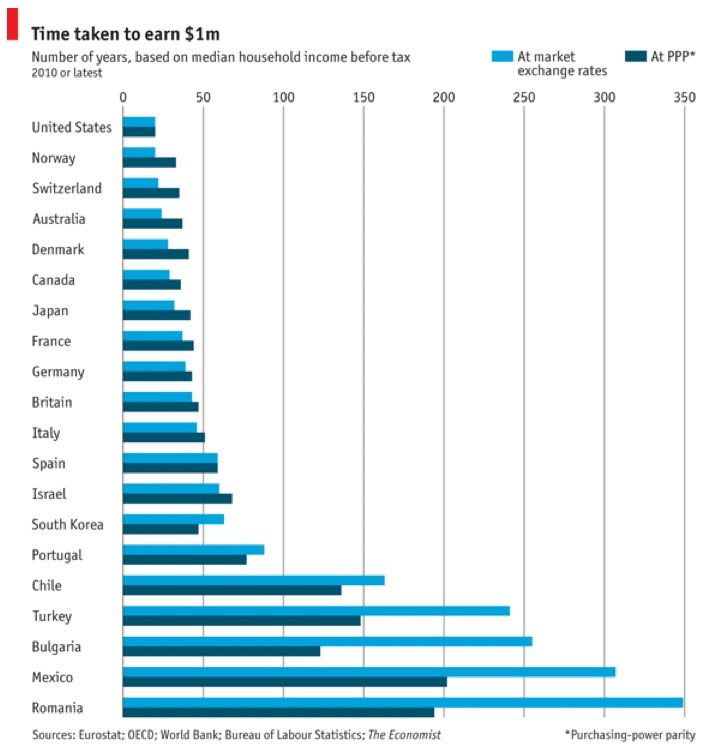 This fascinating chart looks at how long it takes people to earn $1 million in different countries. The U.S. leads the pack, averaging about 25 years. It would take the average Mexican citizen three centuries to earn the same. 59% have gone to college. Of 46 million Millennials, half voted in the 2012 presidential election. Less than 20% aged 18 to 24 are married. Of those ages 25 to 29, slightly more than 40 % are married, an 80 % drop since 1960. When Winston Churchill became Britain's Prime Minister in 1940, he was confronted with a demoralized and despondent war cabinet that was urging him to forge a truce with Hitler by way of Mussolini. Aware that this was a horrible idea, Churchill knew he had to get his Cabinet on his side. He did so with a rousing speech that inspired and gave them hope - successfully winning their support (and the war). The point: Great leaders inspire greatness in their followers by creating the perception that they are all inherently capable of greatness. After all, people do not rise to meet low expectations. After 10 years of research and over 500 in-person interviews with successful people spanning industries, this TED-Ed speaker distilled success down to 8 traits. 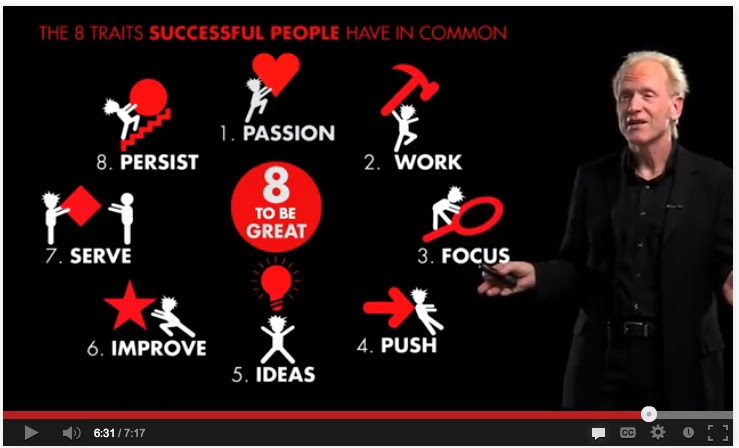 In his findings, he deduced that these 8 traits build a foundation for success, and then learning the necessary skills enables it. Sandberg is referring to Netflix's most recent company culture deck. The company, known for its renegade management structure, prides itself on thriving on uncertainty, creativity and trust, and it is distinctly anti-hierarchical. Tech Crunch boils its most salient points down to: creativity is paramount; discovery is more important than job security; poor employee behavior is a result of misunderstanding; unlimited vacation is powerful. "Prussian Field Marshal Helmuth von Moltke's definition of a good directive: It should tell people only what they need to know in order to fulfill the intention." This article reminds micro-managers that leaving no room for their subordinates to apply creativity and their own insights to their assignments limits possibilities. Also, if a manger is always doing the job of his staff, who's doing his job?